HCM City (VNA) – Member economies of the Asia-Pacific Economic Cooperation (APEC) have exchanged experience in emergency preparedness at a meeting in Ho Chi Minh City. 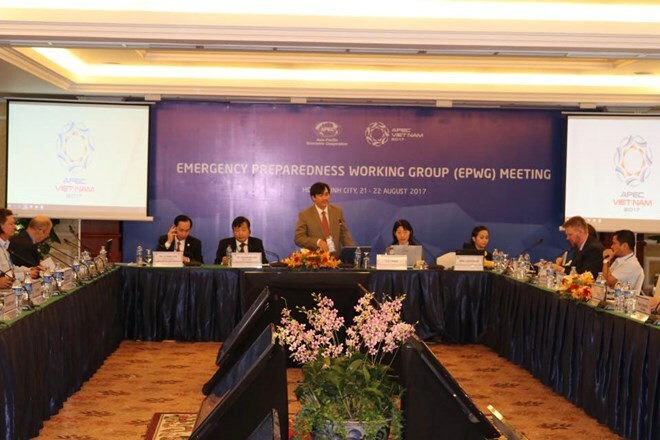 The 12th meeting of the Emergency Preparedness Working Group, from August 21-22, is part of the third APEC Senior Officials’ Meeting (SOM 3). Addressing the opening ceremony, Tran Quang Hoai, head of the General Department for Natural Disasters Prevention ad Control under the Ministry of Agriculture and Rural Development, said since the beginning of this year, the APEC region has faced abnormal natural disasters as well as global climate change challenges. Many types of natural disasters are posing threats to most of countries worldwide, he said, noting that such natural disasters are increasing in both frequency and intensity, causing great losses and affecting production and business activities as well as public health. Therefore, it is a must to intensify information exchange and take more drastic actions in order to minimise the occurrence of natural disasters in the region, he said. The official noted that natural disasters kill 300 people and cause losses worth more than 1 billion USD each year in Vietnam, which has been listed as one of the countries worst affected by climate change. Many regions in Vietnam have faced serious riverbank and coastal landslides, and mountainous localities in the country have been hit by flooding, he said, stressing that natural disasters so far this year have left 100 people dead. Hoai called on the APEC economies to review regulations, work together to build a common mechanism and reach consensus on emergency preparedness in the region. During the meeting, the delegates will discuss issues regarding scientific and technological applications in combating such natural disasters as riverbank and coastal landslides, and floods. Inter-sectoral projects on natural disasters response will also be tabled at the meeting. In an interview granted to the Vietnam News Agency reporters, Chen Hong Yu, a delegate from Taiwan (China), said that hit by many natural disasters, Taiwan has focused on disaster forecast work. He suggested Vietnam and Taiwan cooperate in this field, adding that Taiwan can help Vietnam set up an early warning system for natural disasters. Most APEC economies are situated along the Pacific Ring of Fire, where strong earthquakes, tsunamis, and volcanic eruptions pose constant threats. The region is also the world’s most frequented by tropical cyclone formations, including yearly occurrences of Category 5 cyclones, or super typhoons. Furthermore, the Asia-Pacific Region is subjected to temperature changes in the Pacific Ocean, resulting in the El Niño and La Niña phenomena. All these conditions could be further exacerbated by climate change.